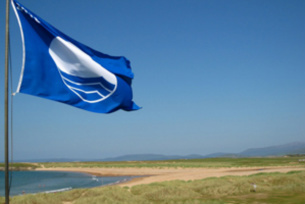 The Blue Flag is operated in Ireland by An Taisce-The National Trust for Ireland and is one of the world’s most recognised eco-labels. Beaches and marinas that achieve this accolade must comply with a specific set of criteria relating to water quality, information provision, environmental education, safety and beach management. At beaches the bathing water must comply with the excellent standard in accordance with the 2006 EU Bathing Water Directive. 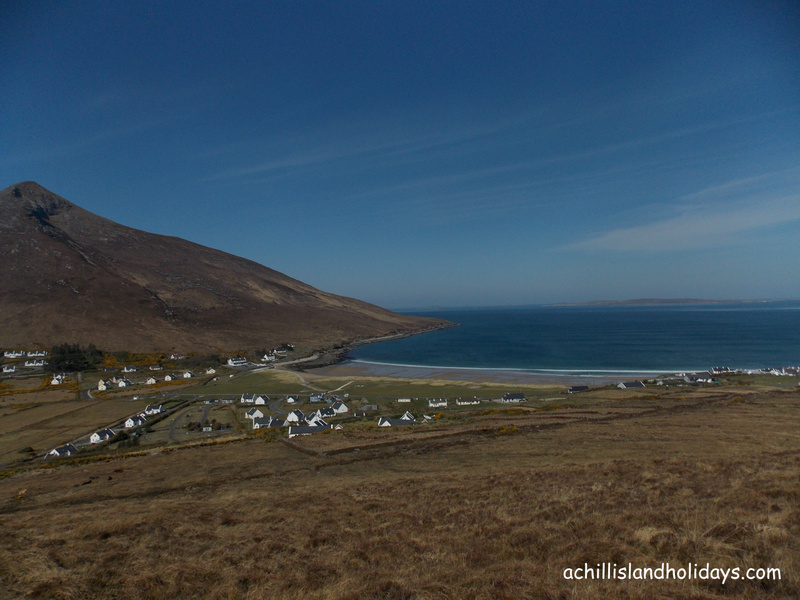 There are 12 Blue Flags awarded to Mayo in 2015, 5 of which are in Achill. 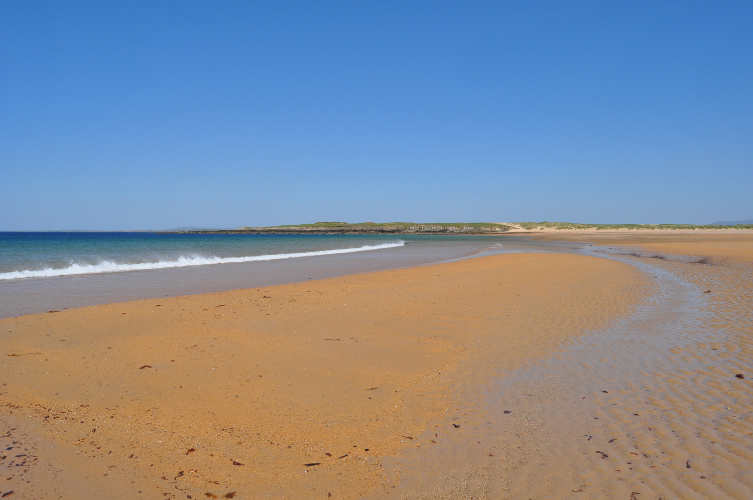 About 3 km (just under 2 miles) east of Dugort village on is The Golden Strand, also known as Barnyagappul Strand, from the Irish for “gap of the horses.” This is the larger of the two beaches at Dugort and, like Silver Strand, has a lifeguard in the summer. Behind the pebble-strewn upper limit of the sandy beach, the dunes host a variety of native plants and wildlife. Also known as Pollawaddy Strand and Silver Strand, Blue Flag Dugort beach lies in the shadow of Slievemore Mountain, next to Dugort village on. 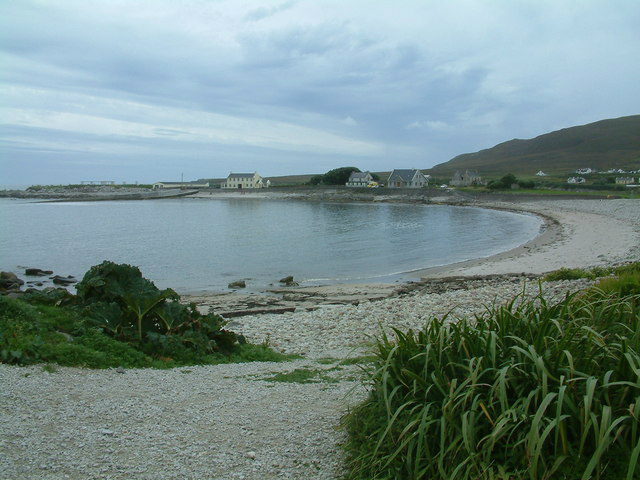 The smaller of the two beaches at Dugort, it is popular with local swimmers, especially for the ceremonial quick dip on New Year’s Day. There is a lifeguard in the summer. Grassy areas behind the beach provide shelter, and there is a parking area with picnic tables. Also known as Trawmore Strand, this Blue Flag beach is approximately 4 kilometres long. It is well signposted in the village of Keel. The sandy beach is backed by a storm beach formed from boulders and shingle thrown onshore during storms. Views to the east of the Minaun Cliffs are spectacular. There is a lifeguard in the summer; swimming areas are clearly marked, to avoid strong undersea currents in places. The beach is very popular for watersports, and surfing instruction is readily available. 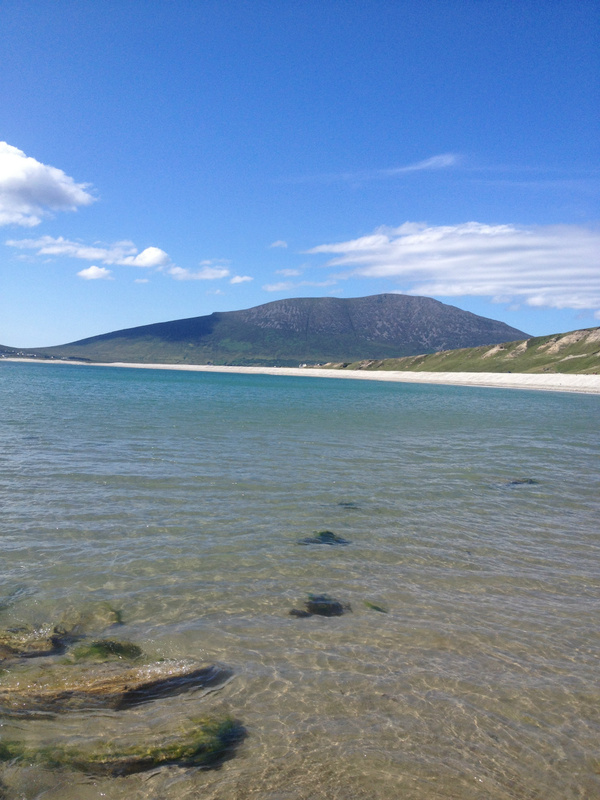 One of the most famous beaches in Mayo. 10km (just over 6 miles) west of Keel village, the road ends at the carpark for the Keem Blue Flag beach, after a spectacular winding drive, overlooking the Atlantic. 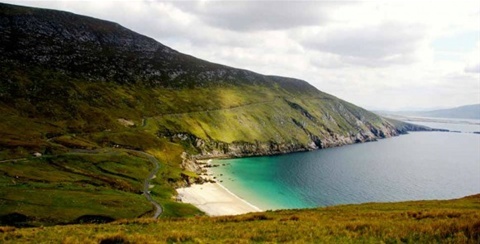 The beautiful horseshoe bay is overlooked by Croaghaun Mountain to the northeast and Moyteoge Head to the southwest; a stepped valley rises behind the beach. 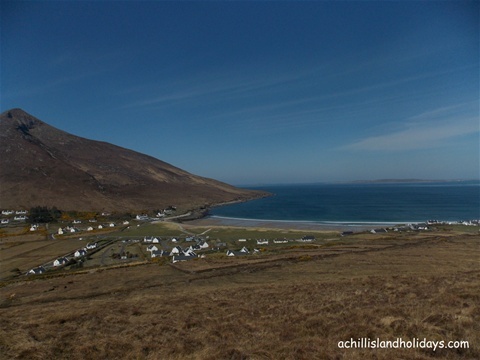 This Blue Flag beach, just 8 kilometres from Achill Sound, is Camport Bay, on a small coastal inlet, at Dooega village. The beach is on the Atlantic Drive, which overlooks the Atlantic Ocean along the southern edge of the Island. The landscape around the beach is a low lying flat coastal grassland of machair. Parking is available, and there is an access ramp, as well as life-saving equipment on the beach, but no lifeguard.